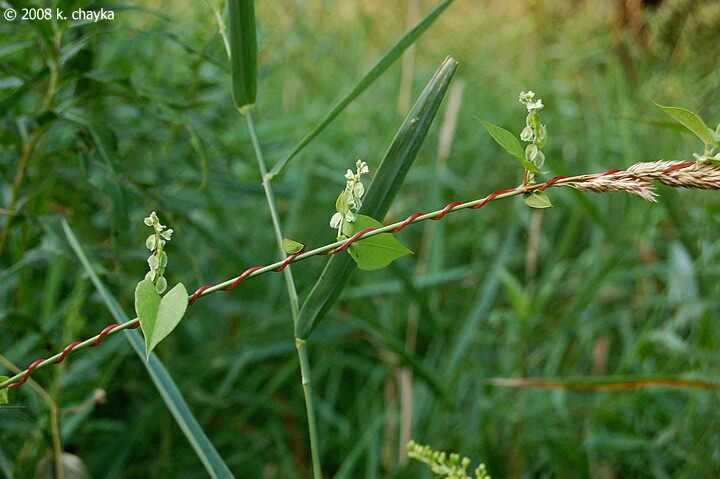 Polygonum scandens.© K. Chayka.Minnesota Wildflowers.minnesotawilflowers.info (Accessed 2/2017). Polygonum is a genus of annual or perennial vines and herbs (ours). Stipules consist of a membranous sheath below each leaf (ocreae), the upper margins often bristly. Stems vining. Leaves usually alternate, simple (1-parted), margins smooth (entire). Flowers small, petals and sepals alike (tepals). Ovary attached above tepals (superior). Fruit consists of developed seed (achene), flat or 3-sided usually held within old tepals.